He talked me into it. It was C.W.’s idea all along. Please let the record read that he talked me into it. We were going to do some carpentry project. I don’t even remember what it was now. We met a little after sunrise, me as myself and he as Dan the Handyman, complete with carpenter’s belt. We opened the door to my shop, and he was crestfallen. The shop is 40 feet by 60 feet and there was hardly a foot of it that was free from stacks of ju…, of things. “What in the world?” He turned to me and shook his head like a schoolteacher who had just been told that the world was flat. I fidgeted. “It’s just things we have collected over the years,” I said. He studied the mess for a moment. “Well,” he said after this perusal. “Let’s get a path cleared so we can work.” He headed for box loaded to the hilt with National Geographic magazines. He said nothing. He just looked at me and shook his head. “It’s got to be good for something,” Yes, I said it in a rather weak voice, the one I reserve for explaining why the housework I do doesn't turn out right. He walked a little farther, kicking short pieces of lumber aside. Spying something of interest, he walked over and picked it up. It was a lightweight ball composed of small pieces of steel wire. He didn’t ask, just held it toward me and cocked his head. “Pieces of wire,” I said. “Too small to use for anything so far, but they could come in handy someday.” He didn’t move. “You just never know,” I added, again in a weak voice. He looked more closely at the photograph. It was a young man in a navy outfit and hat. A nice looking fellow, I might add. 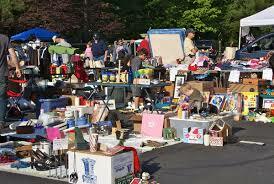 Yard sale: the root of all evil. - C.W. “Let’s clean some of this mess up,” he said, ignoring me. “We need some room to work. The next afternoon, we sat watching Casablanca, me for the hundredth time, he for the twentieth. Bogart was about to mention Paris, and C.W. always cried at that point. I heard someone calling my name from the vicinity of the shop. I told him I would be right back and that he could fill me in on the plot. “There’s a recipe for cornbread gravy in it that someone wants, and that someone is plenty mad.